If you had arrived at 2 p.m. sharp last Friday at the Genoa Township Administrative Office to speak with State Rep. Rick Carfagna, you might have missed him. He was in an adjoining room donating blood for the American Red Cross. “I’ve abandoned my post,” Carfagna joked. That didn’t keep him from speaking with his constituents, or even a writer, while having his blood drawn. The 68th House District Republican from Genoa Township was relaxed, and the setting was informal. Elected to his first term last November, Carfagna was no stranger to the Statehouse. After graduating from John Carroll University with a degree in Political Science, he served as a legislative aide in the House of Representatives in 1999. Carfagna said his experience as a Genoa Township Trustee has also helped him make the transition. When he began his term in January, Carfagna quit his job at Time Warner Cable to work full-time as a legislator. Thus far, he’s had success with three bills passed in the Ohio House. One bill, co-sponsored with Andrew Brenner, R-Powell, was signed into law to assist the Delaware Area Career Center after a snafu with a ballot issue. Another bill would allow advanced-practice nurses to get added authority in treating people experiencing mental health emergencies, such as sending them to a hospital for observation. Carfagna has a bill that will introduce advanced computer science classes in grades kindergarten through 12th. He said the classes would be in coding, web design, or app development, software technology. For example, a high school student could swap an Algebra II class for a coding class. The bill passed the house with bipartisan support before the break. Carfagna can be reached at Rep68@ohiohouse.gov or 614-466-1431. For information, visit www.ohiohouse.gov. 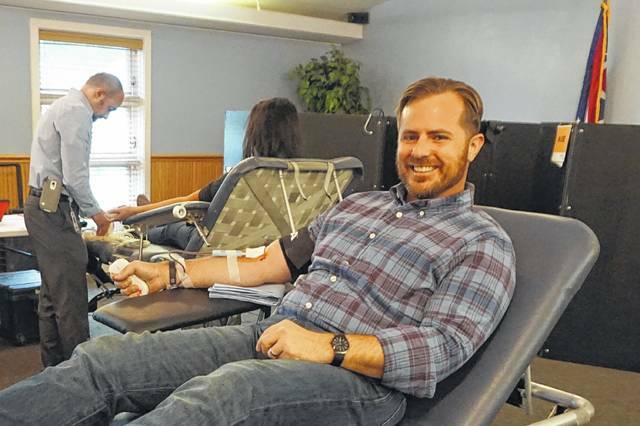 State Rep. Rick Carfagna, R-Genoa Twp., donates blood last Friday at the Genoa Township Administrative Office prior to meeting with constituents.